NETRC is pleased to provide our 2015 New Hampshire Reimbursement Guide, including sections on Medicaid, Medicare, and private payers. The practices regarding reimbursement for telemedicine services are frequently changing as new laws are passed or new policies are adopted by carriers. We invite you to become part of an effort to keep these publications as accurate and up to date as possible. We hope that you find the manual to be a valuable resource and encourage you to send feedback, questions and suggestions for further investigation to us. 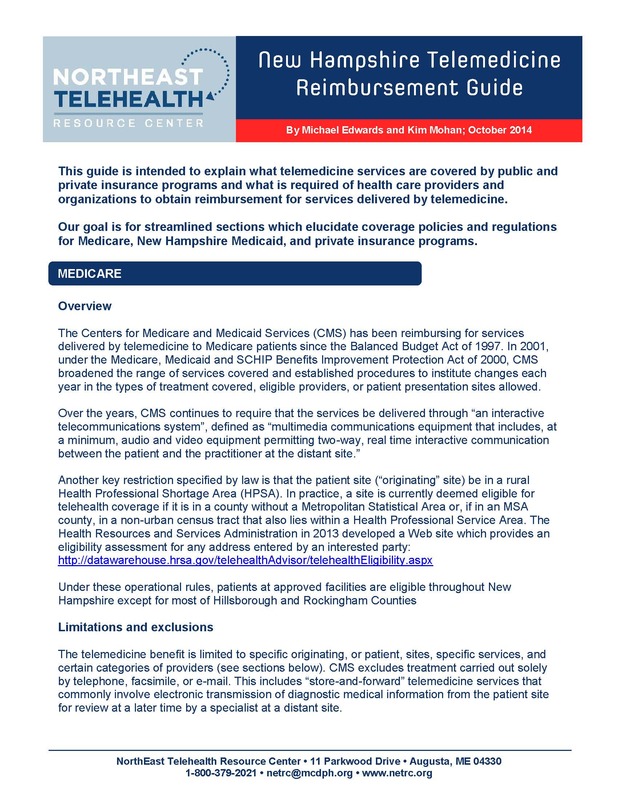 Note: this Guide does not reflect recent Medicaid updates from SB 112 signed July, 2015. Questions about reimbursement? Ask us, we can help. Does Telemedicine Work in ‘Hands-on’ Specialties?